An out and back walk from Dale Head up Pen-y-ghent in the Yorkshire Dales. 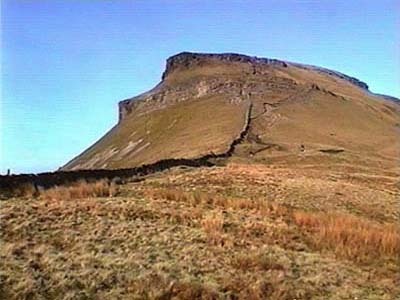 The Pennine Way path is followed from Dale Head to the summit of Pen-y-ghent and then the same path is retraced to the start. The path passes by Churn Milk Hole on its way to joining the Pen-y-ghent path up from Horton in Ribblesdale. From the summit, there are wonderful panoramic views. Parking: Roadside parking just past cattle grid on Stainforth to Halton Gill road - Silverdale Road (grid reference SD 84 3714). The walk starts just past the cattle grid on the Stainforth to Halton Gill road at Dale Head. The Pennine Way passes along this road, and the whole of this walk uses part of the Pennine Way route. Go back over the cattle grid and turn right following the Pennine Way footpath sign through a gate. This leads into a lane down to Dale Head Farm. The lane passes in front and to the right of the buildings and then continues out through a gate heading now directly in line with Pen-y-ghent. After a further one hundred and fifty yards, go through another wooden gate and continue ahead on the track. Follow path for about one-third of a mile, then turn right at the junction of the footpaths by Churn Milk Hole. The footpath here is signed "Pen-y-ghent 1 mile". Continue along the track heading again for Pen-y-ghent. After six hundred yards the footpath turns to wooden boards, as it frequently does in this area, to prevent further erosion, and to keep the path above the sometimes very boggy fells. As the path leaves the wooden path, climb the last fifty yards up the hill to two wooden stiles. Go over the stiles and follow the path keeping near to the wall. After another hundred yards, two stiles go over the wall to the left where the path heads down to Horton-in-Ribblesdale. Ignoring these stiles, carry straight on by the wall where the climb now really starts in earnest. Whilst the path upwards may not be clearly visible, by progressing further up the path unfolds. The path now rises very steeply and becomes less distinct, with the most distinct one skirting the grassy edge and coming back round a little to the left to pass in front of a large almost vertical crag. Keeping straight ahead (a little scrambling may be necessary) the path briefly flattens before another very steep and rocky climb marked by cairns. Towards the top of this a little scrambling may again be necessary, before the path gradient flattens dramatically and returns to being very well defined. In clear visibility the summit is now visible from here. The path runs almost parallel twenty yards to the right of a wall and slowly rises for the final few minutes walk until the triangulation point is reached. Over the wooden stile a few metres from the trig point, a sign points in the three main directions down from the top (Dale Head, Horton and Foxup) with the Horton path the one to follow (walking away from the wall). From the triangulation point there are excellent views across to Fountains Fell, round to Pendle Hill (back in the direction of Dale Head) and round to Ingleborough, which lies beyond the footpath sign on the far side of the wall. The return journey follows the same route back as up, following the steep path back down with Pendle Hill in front, then turn left by Churn Milk Hole, before following the track back out onto the road.